Sometimes we felt we were going to the dogs. Caboodle Cat just wanted to fit in. 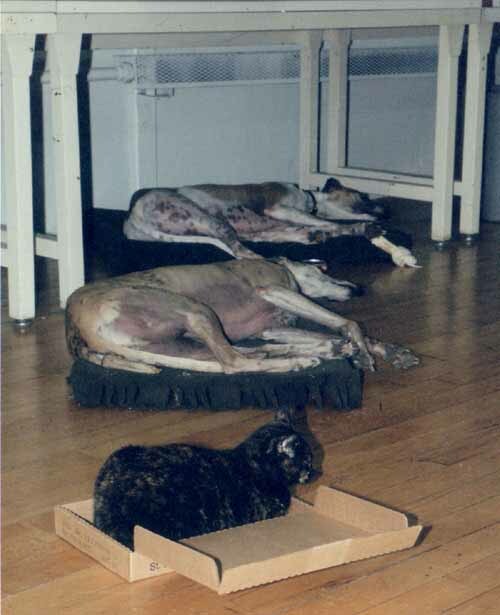 Happy (in the rear, under the table) had a pal Eddie (the greyhound in the middle) who worked for another company in the building (Panametrics, since bought out by General Electric). Eddie came by for doggie day care on a regular basis. The two would race up and down the long upstairs production room. Then pass out. And Caboodle in the box.